KaJeng Wong of Hong Kong earned first prize in this year’s International Piano-e-Competition, capturing the top prize of $30,000 in the global event held at the University of Alaska Fairbanks between May 19 through May 31. Timur Mustakimov of Russia was awarded second prize at the competition, earning $20,000, while Su Yeon Kim of South Korea earned third prize, taking home $10,000. In addition to these prizes, Timur Mustakimov was awarded the Schubert Prize for the best performance of a Schubert sonata in the Second Round, and KaJeng Wong was presented with the Chamber Music Prize for the best performance of a Trio in the semifinals. Since its inception in 2002, the International Piano-e-Competition has been held 11 times, highlighting many wonderful performers, many of whom are making important contributions to the world of classical piano performance and education. What makes the competition unique is that it enables artists from around the world to record and transmit their audition performances over the internet through the use of a Yamaha Disklavier, the world’s most technologically advanced piano. This remarkable instrument is capable of capturing performances as high resolution Musical Instrument Digital Interface (MIDI) data, which are then recreated on other remote Disklavier pianos located anywhere in the world with each note and nuance delivered faithfully and precisely as the artist intended. 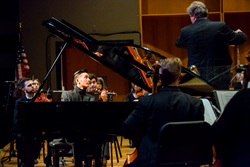 During the competition, contestants performed in Davis Concert Hall played on a Yamaha DCFX Disklavier which streamed data to other connected Disklaviers around the world, including for the first time to China. These remote instruments reproduced the performances in real time, for viewers in concert halls and living rooms alike to enjoy the precise keystrokes and pedal technique of each musician. Finally, a live webcast of the performance with the data stream was broadcast, so that audiences were able to watch the performance remotely, with or without a connected Disklavier.